In the fall of 1986, a friend dropped me off in Studio City, CA, at the home of my mom’s cousins. I had just graduated from Michigan State University with a degree in Telecommunications, TV production, and I wanted to get a job in the TV industry, so Hollywood, or Studio City, was the place to be. I had no experience, no contacts, no car, and no money and yet somehow I thought I could arrive in LA and get a job. Have you ever made a decision that looking back on you shake your head and ask, What was I thinking? Well this was one of those times for me. What was I thinking? I really thought that somehow a degree in a related field would land me a job in TV – boy was I wrong. I quickly realized that I was in way over my head and had no real plan for how to move myself forward. I also realized just how alone I was. While in a city of millions, and living with extended family who tried to be supportive, I still felt isolated and alone. I often spent my afternoons listening to a Christian radio station while in bed with the covers pulled up over my head. It was one of the lowest moments of my life and I still say, what was I thinking? 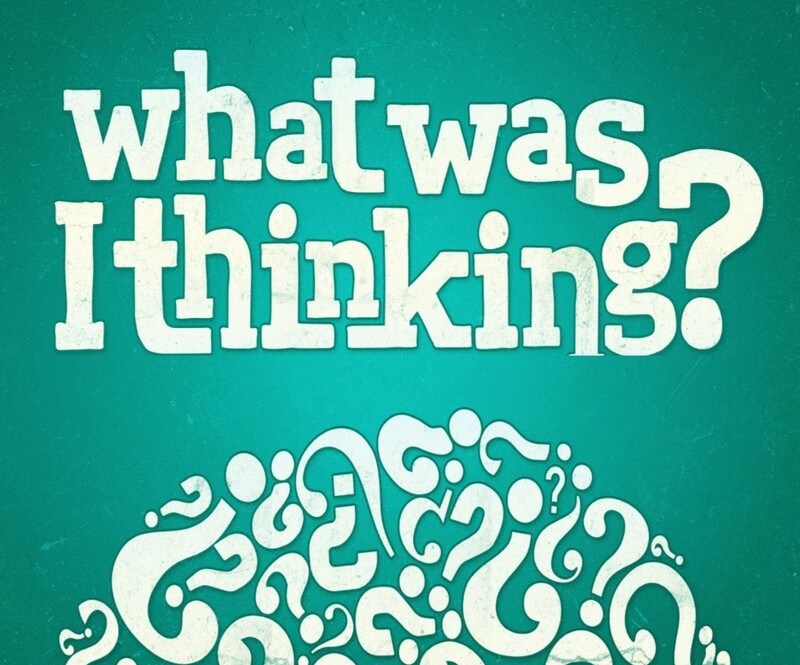 Last week we started this series called, What was I thinking, and our goal is to learn some truths about God that can help us make faithful choices so that we never have to utter those 4 dreaded words. Last week we learned that while we often feel powerless to change our circumstances in life, we are not helpless, and one important thing we can do when we are in trouble is to pray. This week we are going to learn a truth that I really needed when I was in Studio City. What I needed most during those difficult days was to know that God was with me and that I was NOT alone. I felt alone. I tried to hide in my loneliness. I tried to run from my loneliness, but what I really needed to know was that God was more present with me than I could have possibly known. Now here’s the troubling part of my story, I knew that God was always with me. I had read that in the Bible many times and I had personally experienced God’s presence in my life. I had already been through those times when the unseen hand of God suddenly became visible. So while I knew that God was always with me, I had forgotten it, and I doubted it during those dark days. In many ways I was like King Asa, the King of Judah, who felt so alone that he made a foolish decision that cost him dearly. If you weren’t with us last week, Asa was King of Judah, and when he was a young man, Asa trusted God to help him during a very difficult time. God not only helped Asa and the people win a battle, but God was present with them for 35 years, bringing God’s people peace. Asa knew that God was powerful and he trusted that God was present with him, but over time, these were the very truths that he forgot. This is often our problem. We forget, and when problems come up we lose sight of the very truths that helped us in the past and can help us in the future. Much later in his life, when he was once again confronted by a large army, Asa didn’t trust God to be powerful and fight for him. Instead of leaning into the presence of God, Asa went out on his own and formed an alliance with the superpower of his day. It was this failure to trust God’s power and lean into God’s presence that made trouble for Asa, and it is this lesson we need to learn in our own lives. God is always present with us which means we can lean into God’s presence and find strength in God’s power. We may not feel God with us, we may doubt that God is hanging around ready to assist, we may feel that we have wandered too far away, or sinned so greatly that God simply can’t be with us, or doesn’t want to be with us, but nothing could be further from the truth. God is always present with us. God is always present. We can’t run from God, or hide from God, and we can’t even sin so greatly that it pushes God away, because the Bible is pretty clear on this, God is always present. If nothing else, this is a truth we can read in order to remember. In fact, I want to invite you to read this with me. Psalm 139:1-18. This psalm is powerful because it talks about all the times we might feel alone, and yet in those moments God is there. There is no place so high, or low, that God is not already there. There is doubt, or sin, so dark that it can keep God away. There is no decision we can make that God cannot redeem because God is always present to help us. We might struggle, we might suffer some consequences because of our actions, but even then, God is present. Even while I was lying in bed with the covers over my head, God was there, and God was at work in helping me find a way through the darkness. If Asa had known that God was with him, he might not have made an alliance with the King of Aram, and relied upon the power of the world instead of the power of God. If Asa had seen that God was there to fight with him and for him, Asa might have made a better, more courageous decision. We need this kind of vision, we need to see God not only with us, but with us in power. About 50 years after Asa, the prophet Elisha also faced a large army from a king looking to capture him. When Elisha and his servant awake in the morning, this is what happened. 2 Kings 6:15-17. At first, Elisha’s servant couldn’t see the army of God. He couldn’t see the powerful way God was present with them, but then his eyes were opened. How often do we find ourselves in this very situation? We feel overwhelmed and pressed in by troubles on every side, and we think we are all alone, but the truth is that we are not. God is always present with us, and present with us in power. We need this kind of vision, this kind of spiritual vision, or faith, to know that God is with us. If we will look for God, if we will ask God to open our eyes so we can see him, God will open our eyes so that we can see him. Look at 2 Chronicles 16:9. God is constantly searching the world looking for those who are looking for him, and if we will turn to look for God, we will find him. God said, when you search for me with all your heart you will find me. And Jesus said, I am with you always, even to the end of the age. There is not a time or place where God is not with us, and if we can lean into this truth, we will find the strength and power to walk forward in faith. Here are the ABC’s of what will happen in our lives if and when we lean into the presence of God. A – We will experience less Anxiety. When we feel isolated and alone, we feel anxious and unsure, but when we know that God is near, we find peace. Philippians 4:5-7. Knowing God is with us brings a peace that passes our understanding and a peace that can guard our hearts and minds. If I had truly known the Lord was near, the outcome of my time in LA might not have changed, but I might not have had to spend so much time hiding under the covers. We can reduce our anxiety by leaning into the presence of God. B – Our Behavior will change. When we lean into God’s presence it will lead us to better choices which will lead us to a better life. The world often tells us that God is absent and that life is simply what we make it. To me, that is a pretty hopeless situation because I know how powerless I am to change anything. Without God’s presence, there really is no larger sense of meaning and purpose that can help me not only make good choices, but guide my life. But with God at our side, life takes on new meaning. When people really feel alone in life, they often look at desperate measures to either make life full, or make life end. Our behaviors can become desperate and dangerous when we feel isolated, but if we can truly see that God is with us, our behavior might change in many ways – for the better. Knowing God is with us can turn our despair and desperation into power and purpose. What would change in your life if you knew that God was with you? What behaviors might be transformed? What attitudes might be lifted up? What dream might be fulfilled if you knew that God was with you? If we had this vision, the same kind of vision that Elisha had, it might lead us to stepping out in faith because we would have more courage. C – We would have more Courage. If we know that God is with us, and we know that with God’s presence comes God’s power, then we will have more courage to step out in faith. Too often it is fear that holds us back in life and in faith, but when we learn to lean into the presence of God, when we can see that God is with us, it can give us the courage to do so much more. If you knew God was present with you, what would you do? What change would you make? What mission would you undertake? What risk would be worthwhile? What reward would you experience? Courage comes from the presence of God. Be strong and courageous, not because you are physically capable of doing this on your own, not because you are smart and have made all the right decisions, and not because you have horses, chariots, shields, and spears to protect you, be strong and courageous because the Lord your God will be with you wherever you go. If we can lean into this truth and trust that God is with us, we will have less anxiety and more courage, and with less anxiety and more courage we will make better decisions, and better decisions means that we will never have to look back at a time in our lives and ask, What was I thinking? 1. When have you felt isolated and alone? • What led you to this place? • What helped you move beyond this place? • Where was God in your isolation and loneliness? 2. Read and reflect on Psalm 139:1-18. • In what ways have you tried to run from God? • In what ways have you tried to hide from God? 3. Identify three ways (spiritual practices) that you can remind yourself that God is always present with you. 4. Leaning into God’s presence can change your ABC’s. o Give thanks for God’s constant presence. o What one behavior would you like to change? truly knew that God was with you? o Take that step this week – God is with you!